The best authentic Old-Fashioned Gluten-Free & Vegan Buttermilk Biscuits just like your Southern grandmother used to make! Soft, tender, flaky, and begging to be slathered with dairy-free butter, jam, or covered in gravy. This recipe is top-8 allergy-free and only 6 ingredients; in 12 minutes you’ll have warm pull-apart buns ready on the table! Traditional hot cross buns made gluten-free, vegan, and allergy-free with no fuss! These slightly sweet and spiced buns with their iconic cross and raisins will be your family’s new go-to recipe for the Easter and Lenten season! 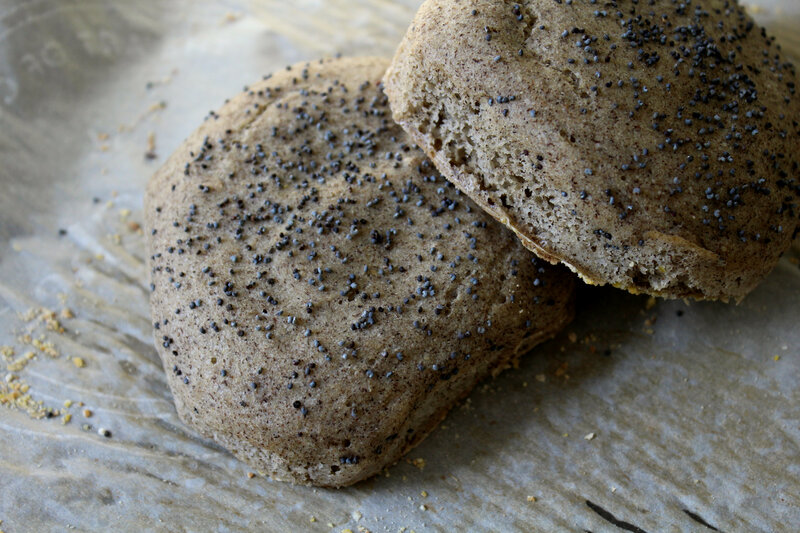 Simple buckwheat English muffin buns that are perfect to have on hand for any gluten-free breakfast or dinner side. Toasted or warm with coconut butter, these yeasted buns are easy to make even for the new baker. Get pumped for a two-parter recipe! Today I am starting off with the bun, the base so to speak. 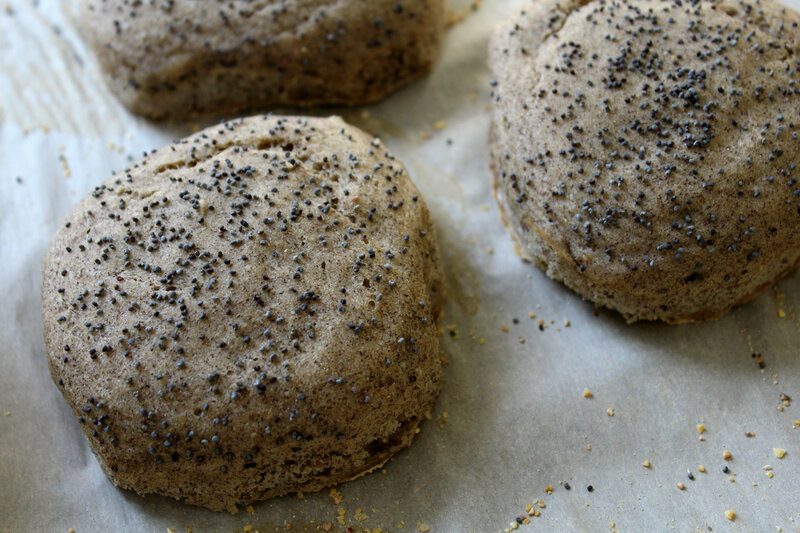 You may remember the first appearance of English Muffin Buns in this recipe. I have been playing around with my own version now and finally got them to be perfect! You might also remember that I said I am not very fond of baking. Cooking will always have my heart and I think it is such a more creative outlet and has greater possibilities. However, I think I now learned to appreciate the art of simple baking. It takes a little more work to get a recipe just right when it comes to baking, but the pay off is always satisfying. Once you have a good base recipe, it is time to go out and make it your own. 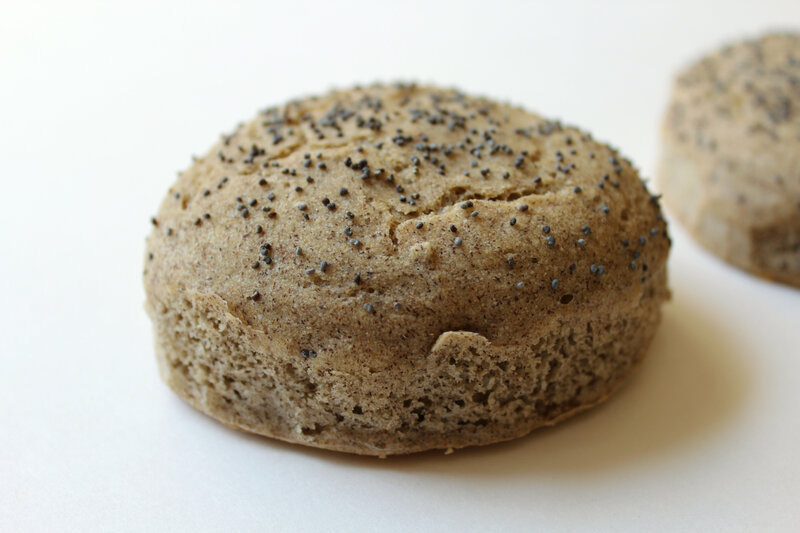 I am still loving buckwheat flour and the light beautiful taste and toasty color it has. Perfect in pancakes, why not perfect in some English Muffins? Playing around with the ratios of the flours is the most crucial part to baking. It is even more crucial when you are baking gluten-free and vegan. With no gluten and no eggs, baking this way can be a bit intimating for even the most seasoned baker. But I love a challenge and proving that gluten-free vegan baked goods trump conventional ones hands-down! So are you interested in the recipe? Did I mention these are just so light and fluffy? 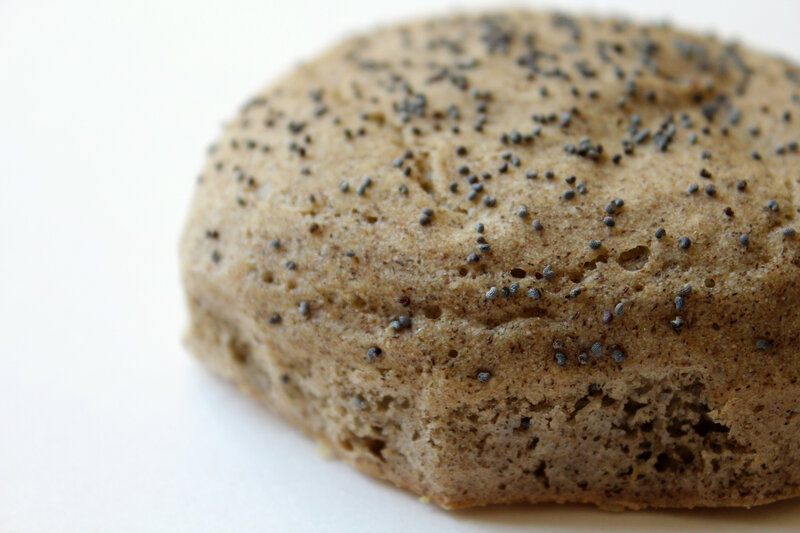 Topped with poppy seeds, and the most recent batch I made I used sesame seeds which were equally as amazing. Perfect for a light breakfast side, a healthy option to enjoy with soup or a salad, or as a bun as you will see in tomorrow’s part 2. These are best toasted and can even be frozen in the freezer ready for use later. That is what I like to do. Make a huge batch, freeze them individually, and then take them out as needed. Just defrost in the microwave for 30 seconds, cut in half, and toast. Perfection! Combine the flour, yeast, and xanthan gum in a large mixing bowl and whisk together. In a microwave safe bowl, heat the water on high to about 90-120 seconds or until the water is very warm to the touch. Then add the water and the oil into the flour mixture and whisk. Keep on mixing until you have a doughy yeasty batter. Cut a piece of parchment paper and place it on a baking sheet (or use your Silpat). Next, use some olive oil to grease the insides on the foil rings and space them out on the baking sheet. Then sprinkle some cornmeal evenly in the bottoms of the rings directly on the baking sheet. 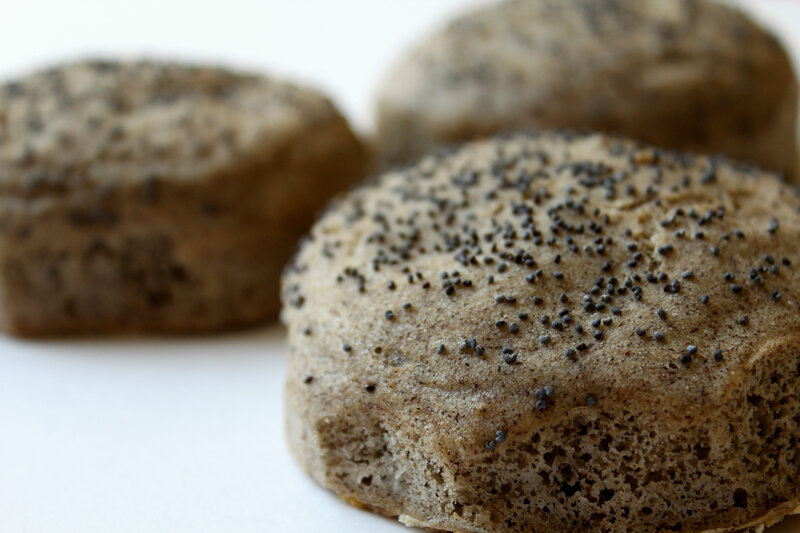 Now sprinkle poppy seeds or sesame seeds on the tops of the buns. Allow the yeast to do it’s magic and let the buns rise for 30 minutes in a warm place. I put the baking sheet on top of the stove. Half-way through (15 minutes), turn your oven on at 375°F to preheat. This will also help with the warm environment for the buns. Once 30 minutes is up and the buns have risen, place the buns in the oven and bake for 15 minutes. Remove those beautifully delicious smelling buns and allow them to cool COMPLETELY. Then your can carefully remove the foil rings by just pealing them off. 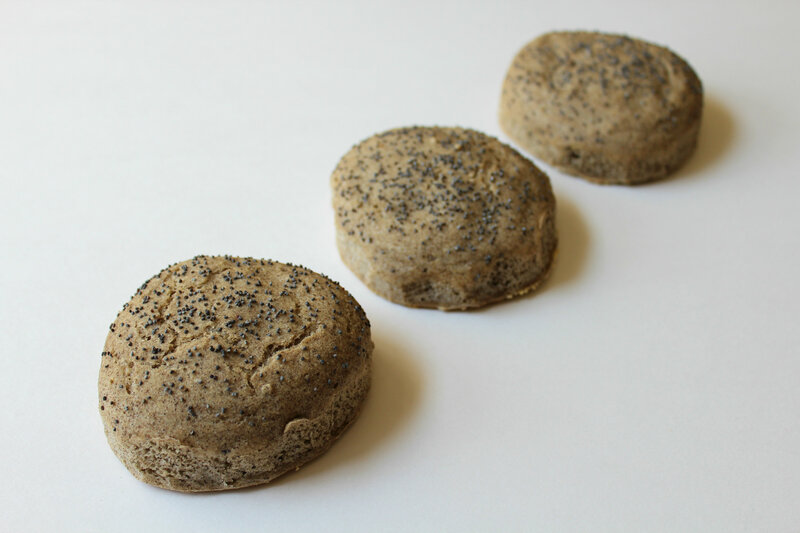 Now, if you want to freeze them, wrap each bun in wax paper and place each in an individual plastic sandwich baggie. Then just freeze’m! To reheat, remove all wrapping, microwave for about 30 seconds on high, cut, and toast!